1.1. What is Fuse on JBoss EAP? Fuse on JBoss EAP is a platform for developing enterprise application integration (EAI) and service-oriented architecture (SOA) solutions. It consists of a service component framework, business rules/complex event processing, life-cycle governance, runtime governance, and process automation. Fuse on JBoss EAP is built on the same core as JBoss Fuse, and includes enterprise messaging, Apache Camel, and Apache CXF. 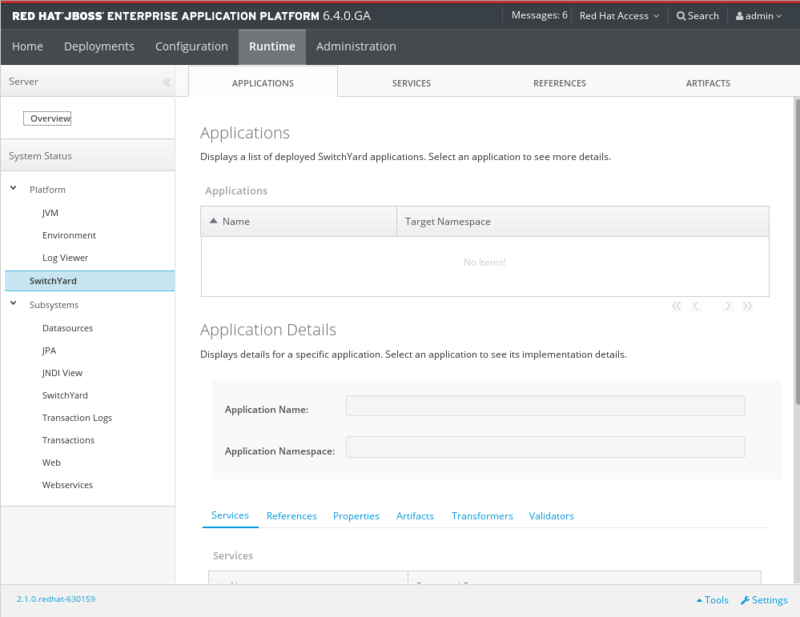 Fuse on JBoss EAP enables users to design, deploy, integrate, and orchestrate business services. Fuse on JBoss EAP can be used to integrate your major business systems into a cohesive infrastructure. Development is simplified with a transparent, lightweight service framework which uses Enterprise Integration Platform (EIP) technology. This allows developers to work with familiar technologies such as Apache Camel, BPEL, BPMN, or POJOs. To reduce the operational costs of production and maintenance, the platform utilizes an automatable, content-aware repository and service activity monitoring. These support the entire service life cycle. The versatile EIP framework is implemented in routing and transformation processes for faster and more efficient integration solutions. A high performance messaging broker supports messaging patterns such as publish-subscribe, point-to-point, and store-forward, and multiple cross language clients. The web services framework exposes integration assets as services and calls external services, supporting all major web services standards. It also supports RESTful calls. A lightweight service development framework provides full life-cycle support for developing, deploying, and managing service-based applications. Manage the life-cycle of services from design, development, and deployment by defining, exposing, and enforcing rules or policies. Capture service activity information, define and collect metrics, and define alerts and SLAs. Integrating your major business systems into a cohesive infrastructure can be a challenge, especially when you have legacy applications. Fuse on JBoss EAP provides a number of ways that enable you to integrate both new and legacy applications. Development is simplified with a transparent, lightweight service framework which uses the EIP technology. This allows developers to focus on higher order concepts while still working with familiar technologies such as Apache Camel, BPEL, BPMN, or POJOs. To reduce the operational costs of production and maintenance, the platform utilizes an automatable, content-aware repository and service activity monitoring. These support the entire service life cycle and development, QA, and production teams with runtime and design-time visibility, monitoring, and alerting. Fuse on JBoss EAP provides an environment for easily applying SOA concepts to integrated applications. A SwitchYard application consists of components such as composite services and composite references. These provide service definitions and accessibility. Along with SwitchYard, Fuse on JBoss EAP is made up of a number of components including a rules-based router (Apache Camel), a web service framework (Apache CXF), and a message broker (HornetQ). Fuse on JBoss EAP ships with a number of components which enable its multi-functional capabilities. SwitchYard leverages the power of Java EE6 and CDI to allow Java objects become services by adding an @Service annotation to your bean. Beans are automatically registered at runtime and references to other services can be injected as CDI beans using the @Inject annotation. Use CDI in your JSP and JSF applications to inject enterprise services into the web tier. Encapsulate business rules as decision services using the JBoss Rules component in SwitchYard. Each service has a well-defined contract with protocol binding details and marshaling details abstracted away by SwitchYard. This transformation engine can be used in conjunction with Fuse on JBoss EAP to process messages. You can use web services to orchestrate business rules using this language. It is included with Fuse on JBoss EAP for the execution of business process instructions. This is the rules engine that is packaged with Fuse on JBoss EAP. It can infer data from the messages it receives to determine which actions need to be performed. A JBoss Fuse subscription includes an entitlement to use embedded BRMS (Drools) as a SwitchYard component only. All other uses (for example, with Apache Camel) require a separate BRMS subscription. A pluggable container in SwitchYard that allows you to expose a business process as a service. A JBoss Fuse subscription includes an entitlement to use embedded BPM as a SwitchYard component only. All other uses (for example, with Apache Camel) require a separate BPM subscription. SwitchYard is a lightweight service delivery framework providing full life-cycle support for developing, deploying, and managing service-oriented applications. This transformation engine can be used in conjunction with Fuse on JBoss EAP to process messages. It can also be used to split messages and send them to the correct destination. Acme Equity is a large financial service. The company possesses many databases and systems. Some are older, COBOL-based legacy systems and some are databases obtained through the acquisition of smaller companies in recent years. It is challenging and expensive to integrate these databases as business rules frequently change. The company wants to develop a new series of client-facing e-commerce websites, but these may not synchronize well with the existing systems as they currently stand. The company wants an inexpensive solution but one that adheres to the strict regulations and security requirements of the financial sector. What the company does not want to do is to have to write and maintain “glue code” to connect their legacy databases and systems. Fuse on JBoss EAP was selected as a middleware layer to integrate these legacy systems with the new customer websites. It provides a bridge between front-end and back-end systems. Business rules implemented with Fuse on JBoss EAP can be updated quickly and easily. As a result, older systems can now synchronize with newer ones due to the unifying methods of Fuse on JBoss EAP. There are no bottlenecks, even with tens of thousands of transactions per month. Various integration types, such as XML, JMS and FTP, are used to move data between systems. Any one of a number of enterprise-standard messaging systems can be plugged into Fuse on JBoss EAP providing further flexibility. Red Hat's official documentation site is at https://access.redhat.com/site/documentation/. There you will find the latest version of every book, including this one. MODE will either be standalone or domain depending on whether your instance of JBoss Enterprise Application Platform is running in standalone or domain mode. Substitute one of these whenever you see MODE in a file path in this documentation. The following interfaces are provided for administering the different components of JBoss Fuse. The JBoss EAP Management Console is a web-based administration tool for JBoss EAP 6. Use the Management Console to start and stop servers, deploy and undeploy applications, tune system settings, and make persistent modifications to the server configuration. The Management Console also has the ability to perform administrative tasks, with live notifications when any changes require the server instance to be restarted or reloaded. JBoss EAP 6.4 must be running. Port 9990 is predefined as the Management Console socket binding. Enter the username and password of the account that you created previously to log in to the Management Console login screen. Select the Runtime tab at the top of the console. Expand the Server menu and select Manage Deployments to go to the Deployments panel. Select Add. A Create Deployment dialog box will appear. In the dialog box, click Browse. Browse to the file you want to deploy and select it for upload. Click Next to proceed. Verify the deployment name and runtime name that appear in the Create Deployments dialog box. Click Save to upload the file once the names are verified. To enable the deployed application, select the application name in the Available Deployments table, and click En/Disable. Confirm the process in the pop-up dialog. A view of the applications and services deployed on the server. A view of various execution metrics. A view of the SwitchYard subsystem configuration. SwitchYard contributes views to the standard Red Hat JBoss EAP management console's Runtime and Profile pages. SwitchYard Message Metrics can be accessed on the JBoss EAP Management Console via Runtime > Status > Subsystems > SwitchYard . This page provides a view of a comprehensive set of metrics aggregated at specific levels within the system. These instructions are for Standalone mode. For Domain mode, select the server you want to work on by clicking the Change Server button. Message Counts: This shows the total number of messages, number of successful messages and number of failed messages. Processing time: This shows the total, minimum, average and maximum processing times. This page also provides the user with the ability to reset metrics. 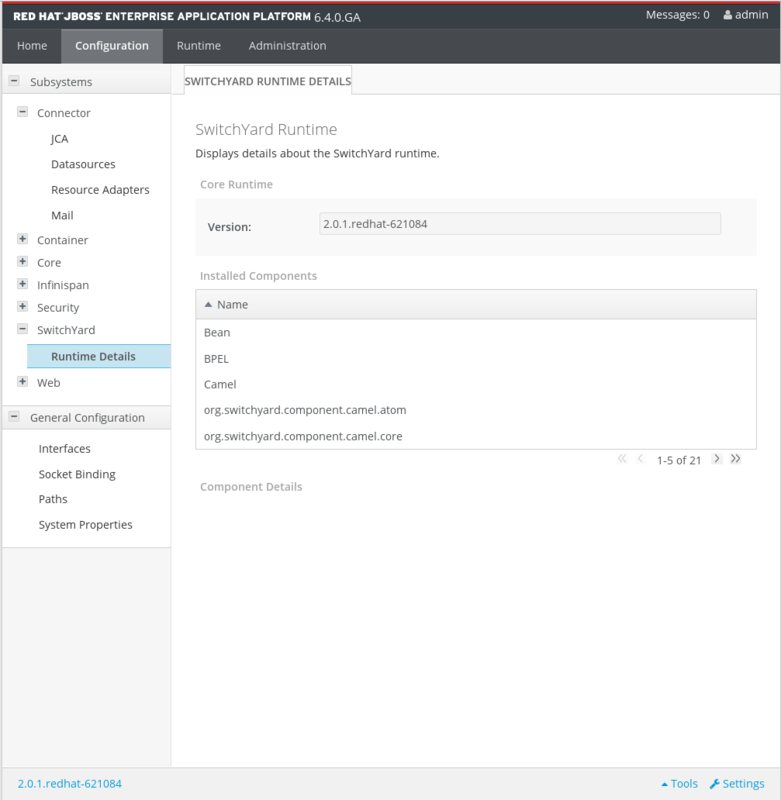 SwitchYard contributes a page to the Runtime Operations section of the JBoss EAP Management Console, which provides views detailing various aspects of SwitchYard applications running on the system. These views may be accessed by clicking Runtime > Runtime Operations > SwitchYard. For Domain mode, select the server by clicking the Change Server button. For each application there is an Application Details panel. This panel contains information for each deployed SwitchYard application, and will show the details when the application is selected in the Applications list. Services provided by the application. Select a service to open the Services tab which will display details for the service. References used by the application. Select a reference to open the References tab which will display details for the reference. Properties defined in the application. The properties may also be edited within this view. Transformers configured in the application. Validators configured in the application. The Services tab displays information about the services provided by the application. This information includes the services provided by the application and the component services used to implement the services. Table 4.2. SwitchYard Applications page, Services Tab, Services Table. The name of the component service providing the implementation for the service. Select an item in the Name column of the Services table to open the main Services tab, which displays details for that service. Table 4.3. SwitchYard Applications page, Services Tab, Component Services Table. The technology used to implement the component (For example, Camel). A list of references required by the component. The raw configuration for the implementation. The References tab lists all the composite references used by the application. The Properties tab provides a list of properties defined in the application. In addition to viewing the properties, use this page to update the values for individual properties. Table 4.4. SwitchYard Applications page, Artifacts Tab, Artifact References Table. The location of the artifact. The from type supported by the transformer. The to type supported by the transformer. The implementation technology used by the transformer (For example Java and XSLT). The name of the validator. The type of the validator. The namespace that the service is defined in. The interface provided by the service. The name pf the gateway. Click the button to start or stop the gateway. The Throttling tab in the details section allows the user to view throttling details for the service. Switch to edit mode, allowing the user to change the throttling configuration. The namespace that the reference is defined in. The interface provided by the reference. The main Artifacts tab displays all artifacts referenced by applications deployed to the system. Selecting a specific artifact reference will populate the Applications Using Artifact table. Selecting an application in the applications table will navigate to the main Applications tab. The JBoss EAP management console contains a SwitchYard Runtime Details page, which can be accessed by selecting the Profiles > Subsystems > SwitchYard > Runtime Details node. Name: the component name, for example, SOAP, Camel. The Configured Properties section providing component specific details. For most components, this section lists any configurable properties and their current settings. The Management Command Line Interface (CLI) is a command line administration tool for JBoss EAP 6. Use the Management CLI to start and stop servers, deploy and undeploy applications, configure system settings, and perform other administrative tasks. Operations can be performed in batch mode, allowing multiple tasks to be run as a group. Note that a successful deploy does not produce any output to the CLI. By default the undeploy command will undeploy and delete the deployment content from a standalone instance of JBoss EAP. To retain the deployment content, add the parameter --keep-content. To undeploy the application and delete the deployment content, enter the Management CLI undeploy command with the filename of the application deployment. To undeploy the application, but retain the deployment content, enter the Management CLI undeploy command with the filename of the application deployment and the parameter --keep-content. The specified application is now undeployed. Note that the undeploy command does not produce any output to the Management CLI if it is successful. There are commands that are available for SwitchYard. To access the commands you first have to operate in the SwitchYard subsystem. Ensure that you have started the Management CLI and connected to it. By completing partially entered commands if there is enough entered for it to be unique. By presenting a list of options if a unique result cannot be found, or if the command is missing. If you enter the following command and press tab, you will get a list of operations available for the SwitchYard subsystem. 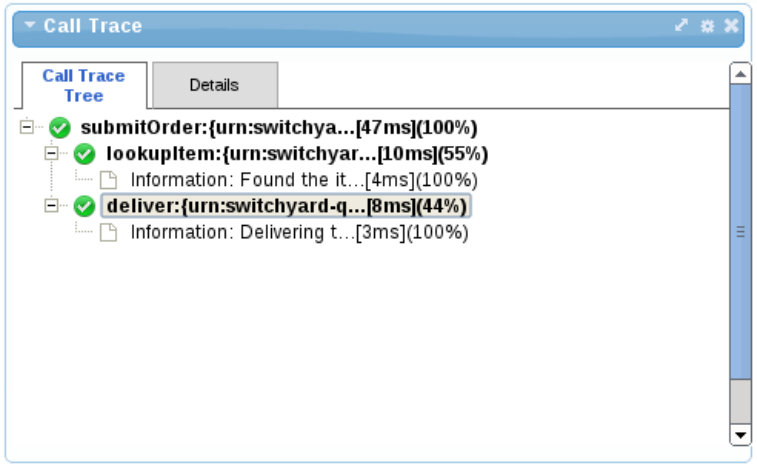 This will show the version of SwitchYard currently running on the JBoss EAP instance. This shows a list of the SwitchYard applications currently running on the JBoss EAP instance. Lists the references used for SwitchYard applications currently running on the JBoss EAP instance. This lists the details for SwitchYard applications running on the JBoss EAP instance. Lists the references used by SwitchYard applications running on the JBoss EAP instance. Lists the services and details used by SwitchYard applications running on the JBoss EAP instance. Reset the message metrics for the SwitchYard subsystem. List the message metrics for the SwitchYard subsystem. Start the gateway for a SwitchYard service. Stop the gateway for a SwitchYard service. Update message throttling for a SwitchYard service. Lists the artifacts used throughout the SwitchYard subsystem. The response will vary depending on the operation entered. JBoss Operations Network gives administrators a single point of access to view their systems. JBoss Operations Network provides a means to develop and monitor a system's inventory. Every managed resource – from platforms to applications to services – is contained and organized in the inventory, no matter how complex the IT environment is. JBoss Operations Network centralizes all of its operations in an installed server. The JBoss Operations Network server communicates with locally installed JBoss Operations Network agents. The agents interact directly with the platform and services to carry out local tasks such as monitoring. The types of resources that can be managed by JBoss Operations Network and the operations that can be carried out are determined by the server and agent plug-ins that have been loaded into JBoss Operations Network. To use JBoss Operations Network with Fuse Service Works, JBoss Operations Network must be installed as instructed in the JON Server Installation chapter of the Installing the JBoss ON Server. Note that both the Server and the Agent must be installed. See Installing and Upgrading an Agent on a Managed Platform from the JAR File for more information about installing the Agent. In addition to the JBoss Operations Network installation, you will also have to download and install the JBoss Fuse Service Works agent Plug-in pack. Use the installation instructions at JBoss Operations Network Plug-in Packs to install the JBoss Fuse Service Works agent plug-in pack. When JBoss Operations Network has been correctly installed, it will automatically detect the JBoss Fuse Service Works services. Ensure that JBoss Operations Network and the JBoss Fuse Service Works instance of JBoss EAP are running. Log in to the JBoss Operations Network server GUI. Click on the Inventory button at the top of the page. Select Servers from the menu on the left hand side. Select SOA-P server from the list presented on the Servers page. Select the Inventory tab on the SOA-P page, then click Connection Settings. Update the User and Passwords fields on the General Properties section with an administrator User ID and Password for the JBoss Fuse Service Works JBoss EAP instance. For more information regarding the configuration of JBoss EAP 6.1 on JBoss Operations Network, see the JBoss Operations Network documentation at Setting up JBoss EAP 6 Instances. JBoss Operations Network provides a number of metrics and administration options for the networks it can be used to control. These functions can be accessed at different levels in the organizational hierarchy. The comprehensive documentation suite covers all the options and available processes. The JBoss Operations Network documentation suite can be found at Red Hat JBoss Operations Network 3.2 Documentation. There are specific functions of JBoss Operations Network that are especially useful for JBoss Fuse Service Works. The most relevant functions are listed below, with links to the specific place in the JBoss Operations Network documentation. The JBoss Operations Network agent can automatically detect SwitchYard archives deployed or deleted independently of JBoss Operations Network. This is known as the Automatic Service Discovery feature. The default frequency for the Automatic Service Discovery is every 24 hours (86400 seconds). The scan frequency of this service and other scan services provided by JBoss Operations Network, can be configured by following the instruction at Setting Discovery Scan Intervals. Navigate to the BPEL console using http://localhost:8080/bpel-console. It is recommended that you only open one bpel-console window within your browser. When the login screen is displayed, enter admin as the default userid and admin as the default password. Overlord RTGov uses a gadget server to display runtime governance information via a set of configurable gadgets. These can be accessed via the gadget server. Accessing the Overlord Runtime Governance console allows you to view governance related information. You can monitor events like response time, call tracing, situations that have been raised, and other details. Once you have configured a login for the server and signed in, you are free to peruse this information. Enter a username and specify a password. A default user is provided called fswAdmin. When the Overlord Runtime Governance UI is displayed the first time, you must enter a new page by pressing the + button. To browse gadgets, click on the Gadget Store button. The Response Time gadget shows average, minimum and maximum summary metrics from the service operations invoked over a period of time. The gadget configuration can be used to select a particular service to display. It is also possible to customize the gadget further to display only the metrics from a particular operation on that service. 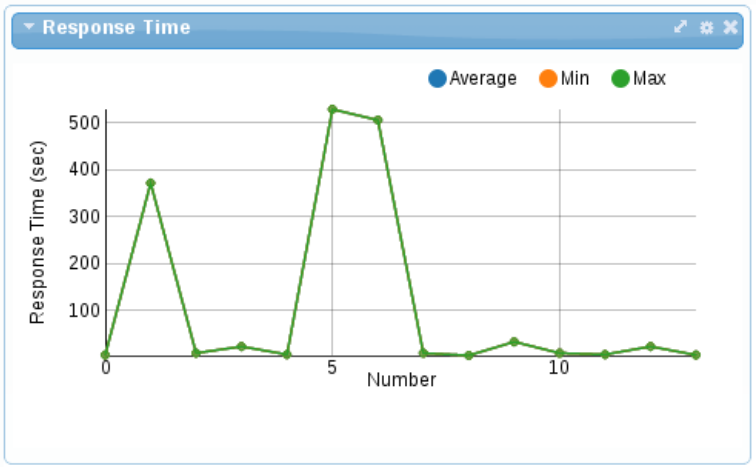 The X-axis represents the number of response time metrics captured for the particular services or operation. Note that it is not related to time. The collection of metrics in the underlying active collection displayed has a maximum size, hence it only discards the metrics when it reaches that maximum threshold. Situations are created by event processors when they detect a "situation of interest". For example, an error or service level agreement violation. These situations are captured in a predefined active collection that is configured to only show the latest situations. They are automatically removed from the collection after a specified time period. This ensures that the gadget displaying the situations only shows the latest problems that are occurring. 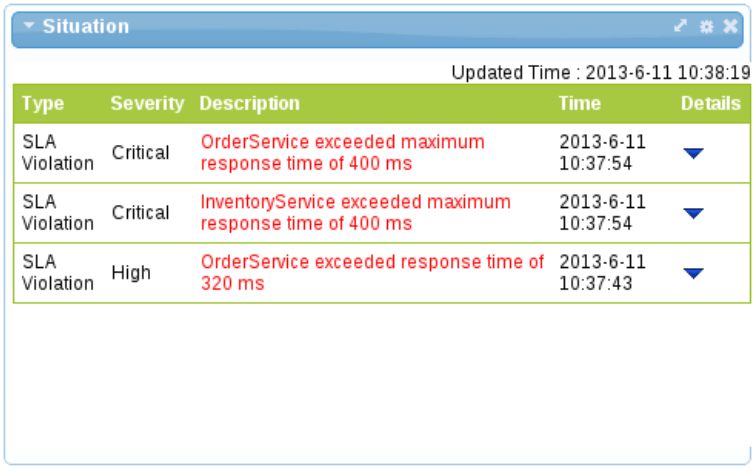 However, situations can also be reported via JMX for more long term management. The Call Trace gadget provides the means to display the invocation history of a particular business transaction instance. The business transaction is identified by entering its globally unique identifier in the gadget’s configuration. The business transaction id is specific to the messages being monitored. For example, a purchasing business transaction may have a purchase order number that is carried with the various business messages. This information can be extracted from the message contents using an "information processor", and the extract value specified in the call trace gadget's configuration. The Service Overview gadget provides a graphical representation of the dependencies (invocation/usage) between services. When displayed as part of a group of gadgets, the representation shows the status of each service and link as a color (green being normal). If the gadget is enlarged, further details are included, such as the service and operation names. Metrics are visible by hovering over an object. When a situation is reported, a red dot will be displayed on that component. Accessing the DTGov Dashboard allows you to view the options available for governance. It includes information such as properties, deployments, and repositories. Enter your credentials and log in. The Dashboard will be displayed. Clicking this option will take you to a list of all the governance-related tasks within JBoss Fuse. Here you can view task filters, task owners, priorities and the dates for which the task is set to be performed. Clicking this option will show you a list of all the deployments that exist within the current lifecycle. You can view the type, environment and dates initiated for any deployment. You can also perform a search to find a deployment. By clicking this tab at the top of the screen, you are able to view artifacts in the S-RAMP Browser. Clicking the Artifacts button will show you the core porpertioes, classifiers, and custom properties for the artifacts in the current lifecycle. SOA Repository Artifact Model and Protocol (S-RAMP) is supported by a Technical Committee at OASIS. It is a specification of SOA repository that provides a common data model and protocol for interacting with a repository of SOA artifacts. For more information, see https://www.oasis-open.org/committees/s-ramp/charter.php. A foundation document that describes the core concepts. An Atom based protocol binding document that describes an Atom based API. You can view S-RAMP's graphical interface in your browser. The S-RAMP dashboard gives you a full visual representation of all the options available to you. Browse the menu options and buttons to see what's on offer. In a browser, navigate to http://localhost:8080/s-ramp-ui . Enter your administrator username and password when prompted. The S-RAMP dashboard will be displayed. Connecting to the S-RAMP server gives you access to the S-RAMP dashboard and repository. This allows you to access artifacts and their metadata in one place. Once you have signed in, you can browse the repository and inspect your data. Open a command terminal and navigate to EAP_HOME/bin directory. Open another terminal and type ./s-ramp.sh. Then type connect and press Tab key. The command will auto-complete to say s-ramp:connect http://localhost:8080/s-ramp-server. Enter username and password to connect via the S-RAMP shell. The username and password are defined in sramp.properties. When you press Tab key, the command will auto-complete to say s-ramp:connect http://localhost:8080/s-ramp-server and when you press the return key the cursor will go from red to green indicating successful connection to S-ramp server. Running the commands in this task will allow you to access the S-RAMP repository and peruse its contents. You can view server output and metadata for artifacts. This lets you view additional details of indexed items. Start the S-RAMP Management CLI. Upload an artifact to the repository. You can also use the UUID of the artifact to obtain the metadata. Set property. To set the core property, use command property set name _overlord.demo.SimpleReleaseProcess.bpmn_. To set custom property, use property set cliProp "this is an important document"
addComment "Comment added to the file"
Once the changes are completed use updateMetaData to push the changes. Run the s-ramp query with Property. You can enable or disable Runtime Governance through the collectionEnabled property in the $JBOSS_HOME/standalone/configuration/overlord-rtgov.properties file. By default, the value of the collectionEnabled is set to false. This property will determine whether activity information is collected when the server is initially started. Run-Time Governance configurations allow you to add or modify classes to manage Run-Time Governance and also define usernames and passwords. To view the Overlord Run-Time Governance properties, access the properties file located in $JBOSS_HOME/standalone/configuration/overlord-rtgov.properties. Add and modify classes to manage governance. collectionEnabled This property will determine whether activity information is collected when the server is initially started. This value can be changed at runtime using the ActivityCollector MBean. ActivityServerLogger.maxThreads This property will determine the maximum number of threads used by the activity collector to report all the activity units to the server. ActivityServerLogger.durationBetweenFailureReports This property controls the duration (in milliseconds) between a failure being reported, if the client is having trouble contacting the activity server. ActivityServerLogger.activityListQueueSize This property defines the queue size for pending activity lists, that are awaiting being reported to the activity server. ActivityServerLogger.freeActivityListQueueSize This property defines the queue size to manage free activity lists that can be reused. BatchedActivityUnitLogger.maxUnitCount, BatchedActivityUnitLogger.maxTimeInterval Activity unit batch logging properties. infinispan.container JNDI name for default cluster to use when not specified explicitly. MVELSeverityAnalyzer.scriptLocation Optional location of a MVEL script used to determine severity levels for nodes and links within the service overview diagram. RESTActivityServer.serverURL This is the URL of the activity server collecting the activity events. RESTActivityServer.serverUsername The username used to access the REST service. RESTActivityServer.serverPassword The password used to access the REST service. The installer sets up the datasources for Runtime Governance, jBPM, SRAMP, and BPEL (Riftsaw). The datasources can be configured in $JBOSS_HOME/standalone/configuration/standalone.xml. The EPN and Active Collection mechanisms both have the ability to make use of caching provided by Infinispan. When running the Red Hat JBoss Fuse in clustered mode (that is, with standalone-full-ha.xml), it provides a default clustered cache container, which is referenced in the infinispan.container property in the overlord-rtgov.properties file. To make sure the individual named caches are clustered correctly, it is necessary to add an entry for each cache into the standalone-full-ha.xml file. For more information on Infinispan configuration, refer JBoss Enterprise Application Platform 6.1 Development Guide. Design-Time Governance consists of the following configurations that can be modified to suit a particular deployment and business. This section describes the two configuration files so that the user can configure Design-Time Governance for their particular deployment environment and organization's unique business processes. A number of configuration properties drive the integration between Design-Time Governance and S-RAMP. The Design-Time Governance back-end and the Design-Time Governance User Interface each have their own separate configuration. This is because the back-end and User Interface are separate applications that can be independently deployed. The above configuration uses BASIC authentication when connecting to the S-RAMP repository. It connects to S-RAMP on localhost (port 8080). The above configuration connects to S-RAMP on localhost (port 8080) and uses SAML bearer token authentication. Create a new workflow, or adapt a sample workflow. Deploy the workflow to S-RAMP. Map S-RAMP query to BPMN2 process name. That is, configure a workflow to execute when repository content changes. This section provides installation steps of a sample workflow called "SimpleReleaseProcess". The management interfaces in JBoss Fuse are secured by default as there are no user accounts initially available, unless you have installed the platform using the graphical installer. This is a security precaution to prevent security breaches from remote systems due to simple configuration errors. Local non-HTTP access is protected by a SASL mechanism, with a negotiation happening between the client and server each time the client connects for the first time from the localhost. This task describes how to create the initial administrative user, which can use the web-based Management Console and remote instances of the Management Command Line Interface. HTTP communication with JBoss EAP 6 is considered to be remote access, even if the traffic originates on the localhost. Therefore, you must create at least one user in order to be able to use the management console. If you attempt to access the management console before adding a user, you will receive an error because it does not even deploy until the user is added. Invoke the add-user.sh or add-user.bat script. Change to the EAP_HOME/bin/ directory. Invoke the appropriate script for your operating system. Choose to add a Management user. Hit ENTER to select the default option a to add a Management user. This user is added to the ManagementRealm and is authorized to perform management operations using the web-based Management Console or command-line based Management CLI. The other choice, b, adds a user to the ApplicationRealm, and provides no particular permissions. That realm is provided for use with applications. When prompted, enter the username and password. You will be prompted to confirm the password. Review the information and confirm. You are prompted to confirm the information. If you are satisfied, type yes. Choose whether the user represents a remote JBoss EAP 6 server instance. Besides administrators, the other type of user which occasionally needs to be added to JBoss EAP 6 in the ManagementRealm is a user representing another instance of JBoss EAP 6, which must be able to authenticate to join a cluster as a member. The next prompt allows you to designate your added user for this purpose. If you select yes, you will be given a hashed secret value, representing the user's password, which would need to be added to a different configuration file. For the purposes of this task, answer no to this question. You can enter additional users if desired by repeating the procedure. You can also add them at any time on a running system. Instead of choosing the default security realm, you can add users to other realms to fine-tune their authorizations. To use the application realm, use the -a parameter. You can suppress the normal output of the add-user script by passing the --silent parameter. This applies only if the minimum parameters username and password have been specified. Error messages will still be shown. Any users you add are activated within the security realms you have specified. 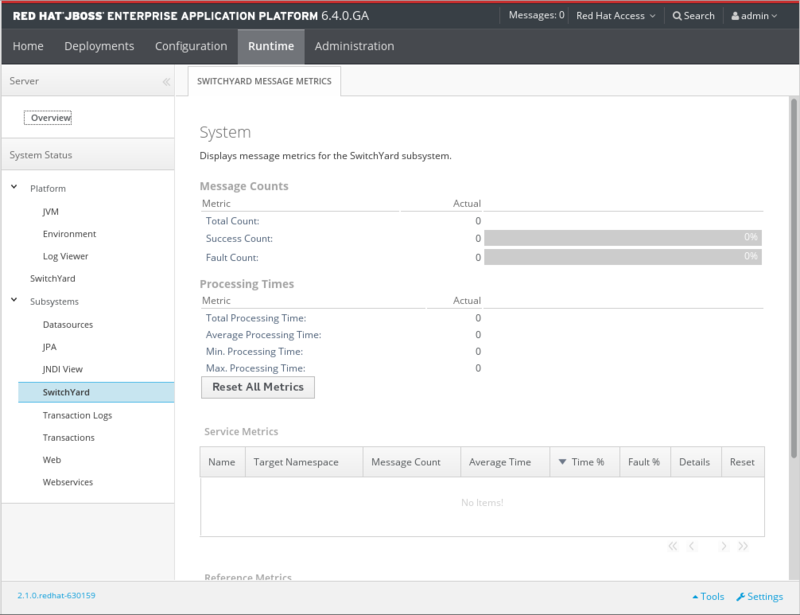 Users active within the ManagementRealm realm are able to manage JBoss EAP 6 from remote systems. The following table describes the arguments available for the add-user.sh or add-user.bat command. This argument specifies to create a user in the application realm. If omitted, the default is to create a user in the management realm. This argument specifies the domain configuration directory that will contain the properties files. If it is omitted, the default directory is EAP_HOME/domain/configuration/. This argument specifies an alternate standalone server configuration directory that will contain the properties files. If it is omitted, the default directory is EAP_HOME/standalone/configuration/. This argument specifies the name of the alternate user properties file. It can an absolute path or it can be a file name used in conjunction with the -sc or -dc argument that specifies the alternate configuration directory. A comma-separated list of groups to assign to this user. This argument specifies the name of the alternate group properties file. It can an absolute path or it can be a file name used in conjunction with the -sc or -dc argument that specifies the alternate configuration directory. It can not be the same as the user name. It must contain at least 8 characters. It must contain at least one alphanumeric character. It must contain at least one digit. The name of the realm used to secure the management interfaces. If omitted, the default is "ManagementRealm". Run the add-user script with no output to the console. Display usage information for the add-user script. By default, user and role information created using the add-user.sh script is stored in properties files located in the server configuration directory. The server configuration information is stored in the EAP_HOME/standalone/configuration/ directory and the domain configuration information is stored in the EAP_HOME/domain/configuration/ directory. This topic describes how to override the default file names and locations. To specify an alternative directory for the server configuration, use the -sc argument. This argument specifies an alternative directory that will contain the server configuration properties files. To specify an alternative directory for the domain configuration, use the -dc argument. This argument specifies an alternative directory that will contain the domain configuration properties files. To specify an alternative user configuration properties file, use the -up or --user-properties argument. It can an absolute path or it can be a file name used in conjunction with the -sc or -dc argument that specifies the alternative configuration directory. To specify an alternative group configuration properties file, use the -gp or --group-properties argument. It can an absolute path or it can be a file name used in conjunction with the -sc or -dc argument that specifies the alternative configuration directory. By default S-RAMP uses the standard EAP Application Realm configuration as its authentication source. This means that adding users is a simple matter of using the existing EAP add-user script. If you are running on Windows you can use the add-user.bat script. Otherwise run the add-user.sh script. Both of these scripts can be found in EAP's bin directory. If you change the S-RAMP repository name in the standalone.xml file and set the new repository name in standalone/configuration/sramp.properties (under sramp.config.jcr.repository.jndi-path), make sure you modify the user's roles. If the role that grants users access to the ModeShape repository is admin.sramp, where the ModeShape role is admin on repository named sramp, ensure you change this value to admin.<new repository name> in the application-roles.properties file. By default Design-Time Governance uses the standard EAP Application Realm configuration as its authentication source. This means that adding users is a simple matter of using the existing EAP add-user script. If you are running on Windows you can use the add-user.bat script. Otherwise run the add-user.sh script. Both of these scripts can be found in EAP's bin directory. This example creates a user who can view and complete Development and Test environment human tasks. Any other human tasks is not visible. Headless mode is a mode that allows you to run JBoss Fuse on a server without a monitor attached. The main advantage of running JBoss Fuse in this particular mode is that the product will launch automatically when the server reboots, saving your valuable time. There is no need to intervene and launch JBoss Fuse manually. To achieve this, JBoss Fuse runs as a background daemon (Linux) or service (Microsoft Windows). Administrator privileges on the server are required. Use the following procedure to install JBoss Fuse as a service on Red Hat Enterprise Linux when the installation has been done using the graphical installer. The start-up script and an associated configuration file are located in the EAP_HOME/bin/init.d/ directory. Open the configuration file jboss-as.conf to edit it. There are several options within the jboss-as.conf file. At the minimum, specify the correct values for JBOSS_HOME and the JBOSS_USER variables. If these variables are absent, add them. Copy the modified configuration file to the /etc/jboss-as directory. Copy the start-up script to the /etc/init.d directory. Add the start-up script as a service. Add the new jboss-as-standalone.sh service to list of automatically started services, using the chkconfig service management command. Test that the service has been installed correctly by using the standard syntax for starting Red Hat Enterprise Linux services. If everything has gone correctly, you should get a green [OK]. If you get an error, check the error logs and make sure your paths are correct in the configuration file. Make the service start automatically when you restart your server. To add the service to the list of services which start automatically when your server restarts, issue the following command. JBoss Fuse starts automatically when Red Hat Enterprise Linux reaches its default run-level, and stops automatically when the operating system goes through its shutdown routine. The purpose of the clustered service registry is to store information about the services that are used in a cluster of SwitchYard instances. Service Name: It stores the name of a service. Domain Name: It stores the name of a domain. Endpoint Address: It stores the physical access point for the service. Node Name: It stores the cluster node on which the service is deployed. Service Contract: It stores the abstract invocation contract for the service which consists of the message exchange pattern and message types. Shared Runtime Registry: A shared, distributed runtime registry that enable individual instances to publish and query service endpoint details. Remote Communication Channels: An internal communication protocol that enables a service client to invoke a service, hosted in a remote instance. The runtime registry supports a replicated Infinispan cache. Each instance in a cluster points to the same replicated cache. When a node joins a cluster, it immediately has access to all remote service endpoints published in the registry. If a node leaves the cluster due to failure or shutdown, all service endpoint registrations are immediately removed for that node. The registry is not persisted, so manual clean-up and maintenance is not required. The communication channel is a private intra-cluster protocol used by instances to invoke a remote service. At present, the channel is based on HTTP. The SwitchYard registry is a runtime registry and not a publication registry. The state of services within the registry is tied directly to the current state of services deployed within a cluster. To create a cluster of SwitchYard instances, start two or more instances with a shared Infinispan cache. When the instances are up, you can deploy applications independently to each instance. A homogeneous cluster (a cluster of identical machines) consists of identical applications deployed on each node. However, a heterogeneous cluster consists of different applications and services deployed on each instance. To verify the cluster setup, deploy a consumer application to one instance and a provider application to another. Start two or more instances on different nodes. Indicate the services that are clustered in the switchyard.xml file. By default, SwitchYard uses the default cache in the cluster cache container which comes pre-defined in the standalone-ha.xml file. You can control the services in the application that can be published in the cluster's runtime registry and the references that can be resolved by clustered services. To enable a service to be published in the cluster's runtime registry, promote the service in the application and add a <binding.sca> with clustering enabled to it. To invoke a service in a cluster, promote the reference and add an SCA binding with clustering enabled. In a clustered environment, it is recommended to have a dedicated runtime governance server separate from the execution servers. In this case, all execution servers connect to the governance server via the runtime governance client. Depending upon the load of the runtime governance server, it may be necessary to set up a cluster of governance servers as well. If you have a cluster of runtime governance servers, then they only need to connect to the same database instance. However, it is also possible to configure each runtime governance server to have its own S-RAMP database. The JBoss Fuse installer configures all components to use the same database by default so that runtime governance and S-RAMP share the same database instance. However, this is not mandatory. Perform the following steps on all servers in the cluster. Please note that this is just one of several possible configurations of governance components in a clustered environment. Isolating services so that they are accessible only to the clients who need them increases the security of your network. JBoss EAP 6 includes two interfaces in its default configuration, both of which bind to the IP address 127.0.0.1, or localhost, by default. One of the interfaces is called management, and is used by the Management Console, CLI, and API. The other is called public, and is used to deploy applications. These interfaces are not special or significant, but are provided as a starting point. The management interface uses ports 9990 and 9999 by default, and the public interface uses port 8080, or port 8443 if you use HTTPS. If you expose the management interfaces to other network interfaces which are accessible from remote hosts, be aware of the security implications. Most of the time, it is not advisable to provide remote access to the management interfaces. You can specify the IP address of the management interface, public interface, or both. Stop JBoss EAP 6 by sending an interrupt in the appropriate way for your operating system. If you are running JBoss EAP 6 as a foreground application, the typical way to do this is to press Ctrl+C. Restart JBoss EAP 6, specifying the bind address. 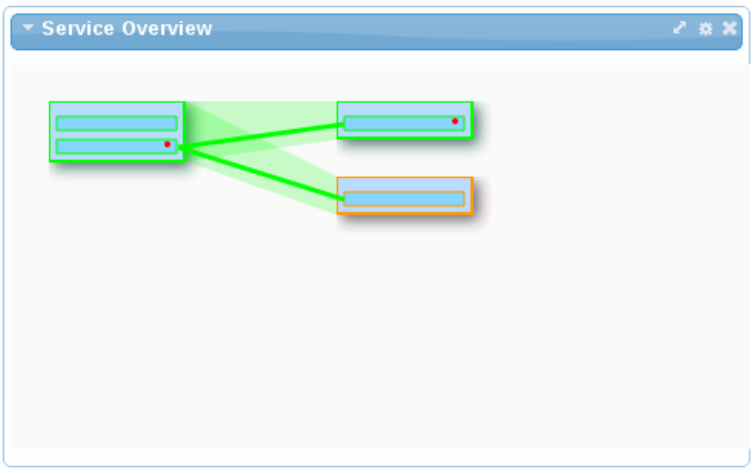 Use the -b command-line switch to start JBoss EAP 6 on a specific interface. Example 16.1. Specify the public interface. Example 16.2. Specify the management interface. Example 16.3. Specify different addresses for each interface. Example 16.4. Bind the public interface to all network interfaces. It is possible to edit your XML configuration file directly, to change the default bind addresses. However, if you do this, you will no longer be able to use the -bcommand-line switch to specify an IP address at run-time, so this is not recommended. If you do decide to do this, be sure to stop JBoss EAP 6 completely before editing the XML file.